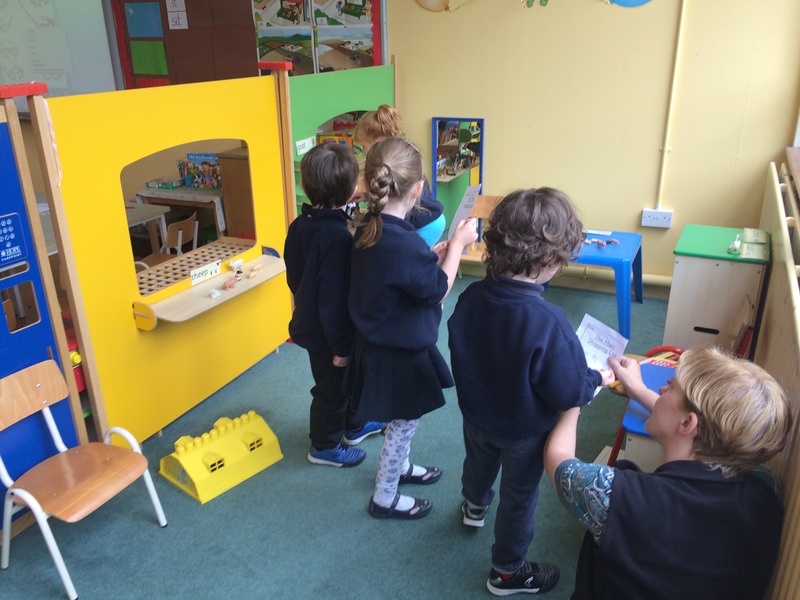 This week the Junior Infants are in role as customers and shopkeepers in the Farm Shop in the Home Corner. 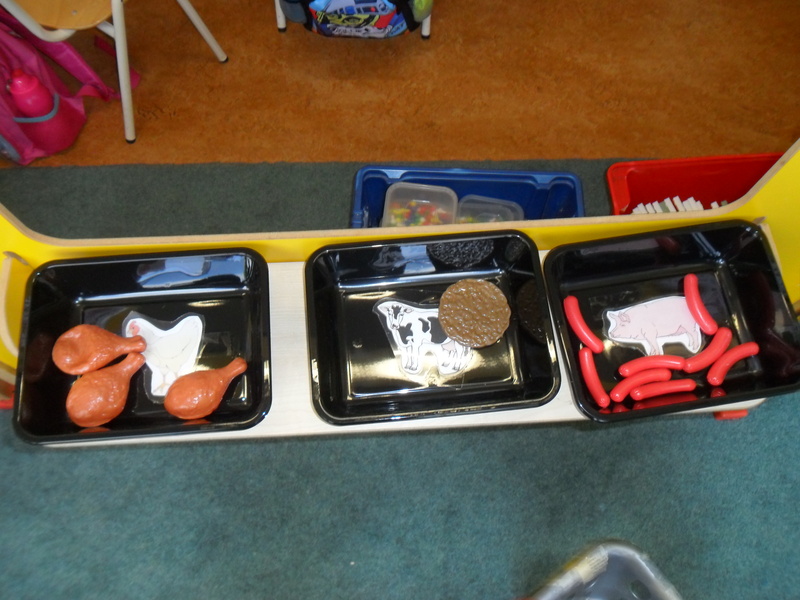 This activity was excellent for sorting and classifying the different types of food. They also revised what products different farm animals provide us with. 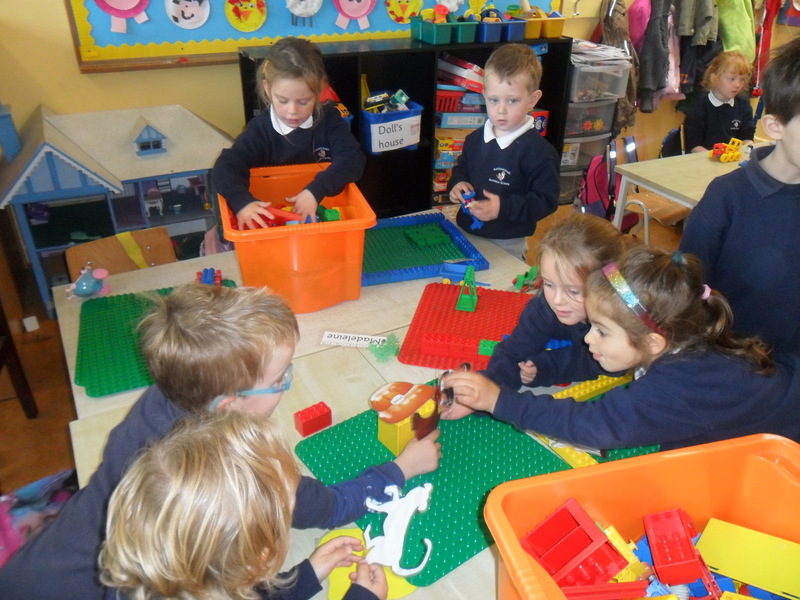 The children re-enacted the story of The Little Red Hen in Small World by building the different scenes out of Lego and then telling the story. 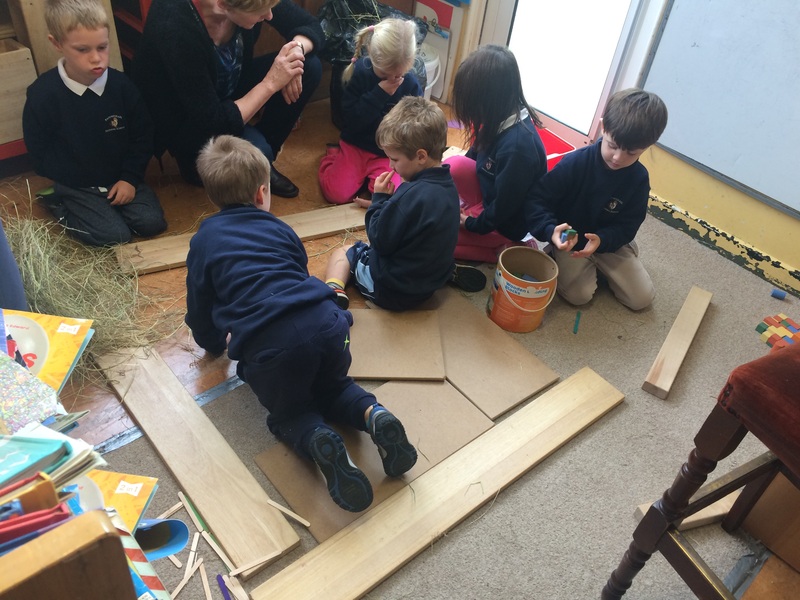 They have been learning about the story of wheat and Harvest. The Infants were building farm machinery out of the large construction blocks and from Mobilo. They then played with their constructions. 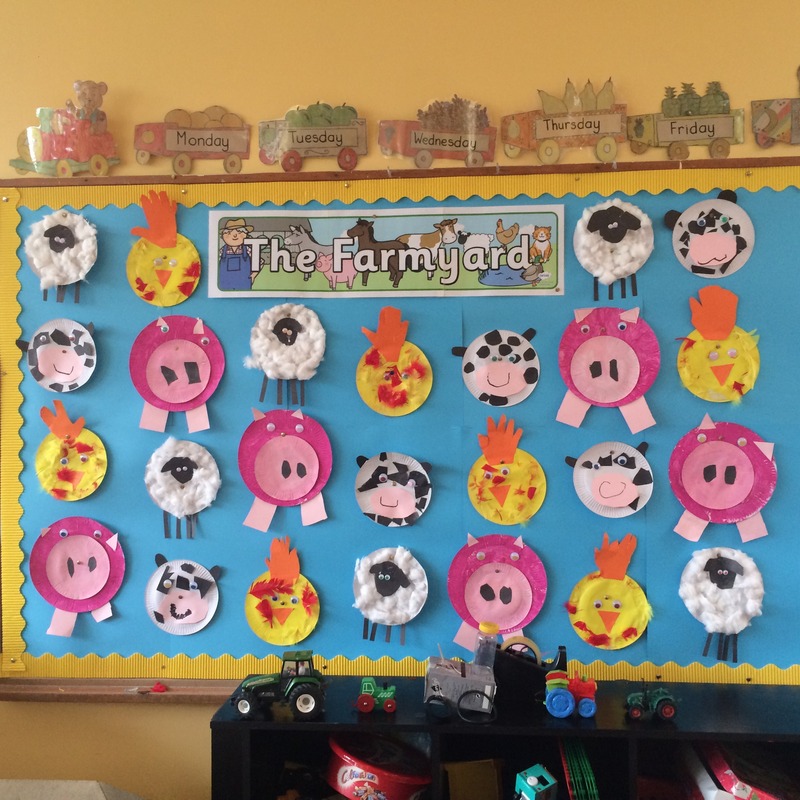 This week the Junior Infants are continuing to learn about farming. They are in role as vets in the home corner, building farms out of Lego, constructing the story of ‘The Three Little Pigs’ and retelling it, and building tractors out of junk. 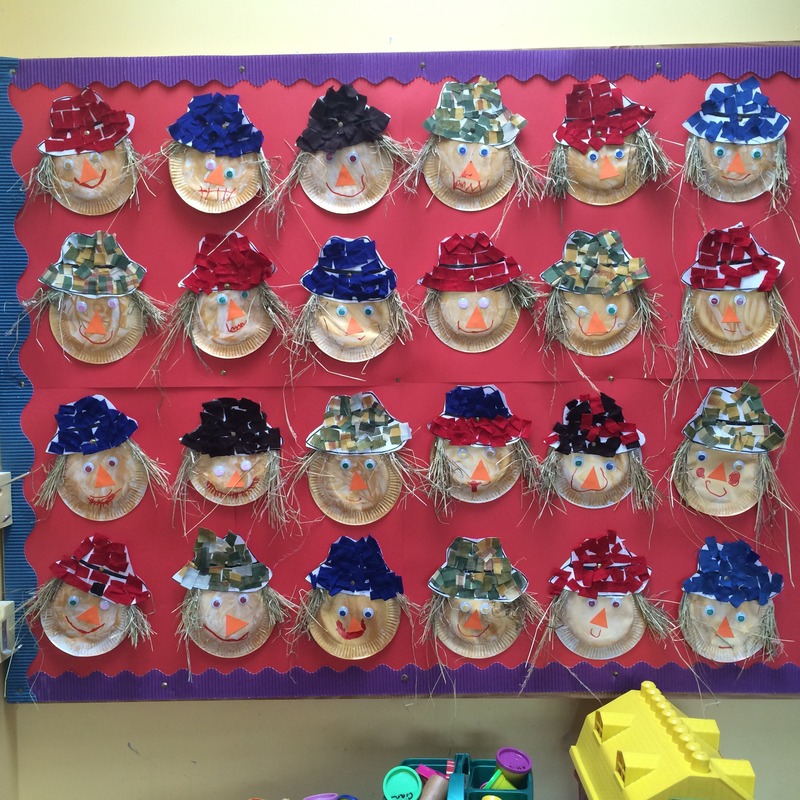 This month’s topic is ‘farming’. 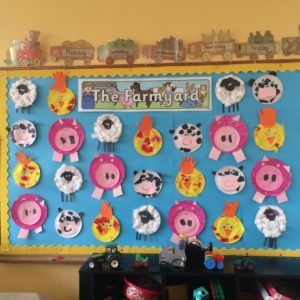 The children have been learning about the different jobs a farmer has to do, how a farm changes from season to season, what food and products various farm animals provide us with and how most of the food we eat comes from farms. 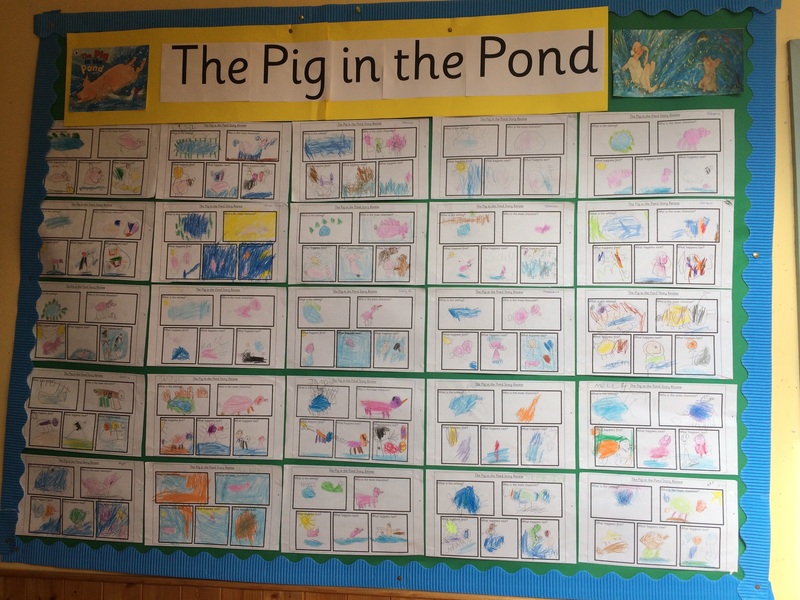 They are exploring stories to do with this topic like ‘The Pig in the Pond’, ‘Farmer Duck’, ‘The Three Little Pigs’ and ‘The Little Red Hen’. 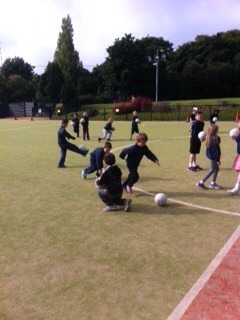 Junior Infants to 2nd Class inclusive have started to play gaelic football during school hours once a week. 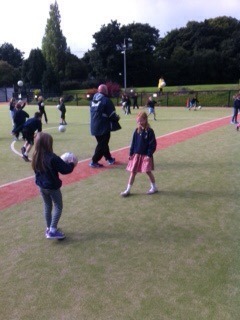 This initiative by the Shankill GAA club gives half hour coaching sessions to each of the four classes. The children are really enjoying the sessions which are excellent for their hand eye co-ordination and team participation. 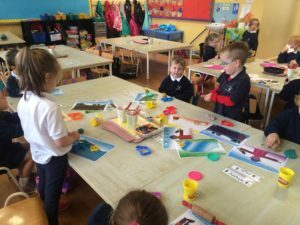 The Rathmichael School and Parish Fete took place on 5th September. The sun shone, the people came, fun was had and all in all a very successful day yet again. It comes around every year. We all look forward to it. It really is a marked event in the calendar for the Shankill Community. Well done to all who took part, their hard work and for creating such a great atmosphere. 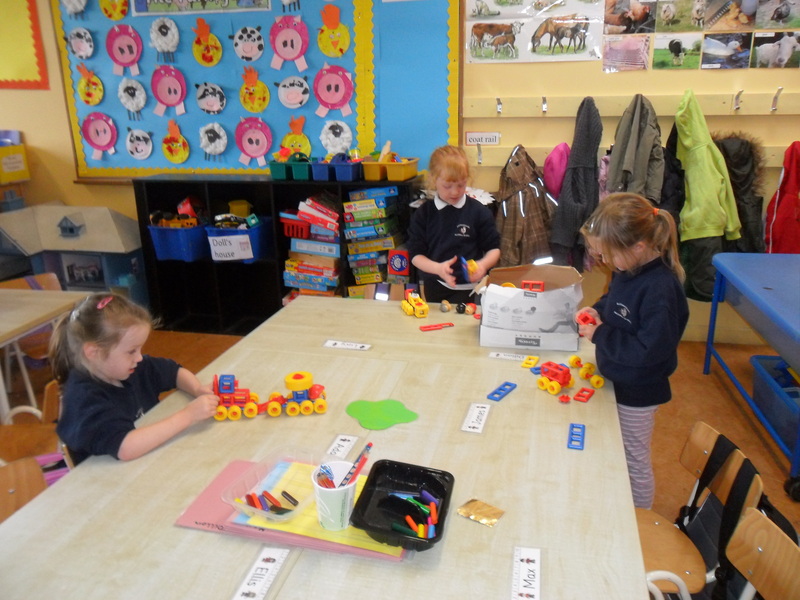 The children have returned to school and are working hard. 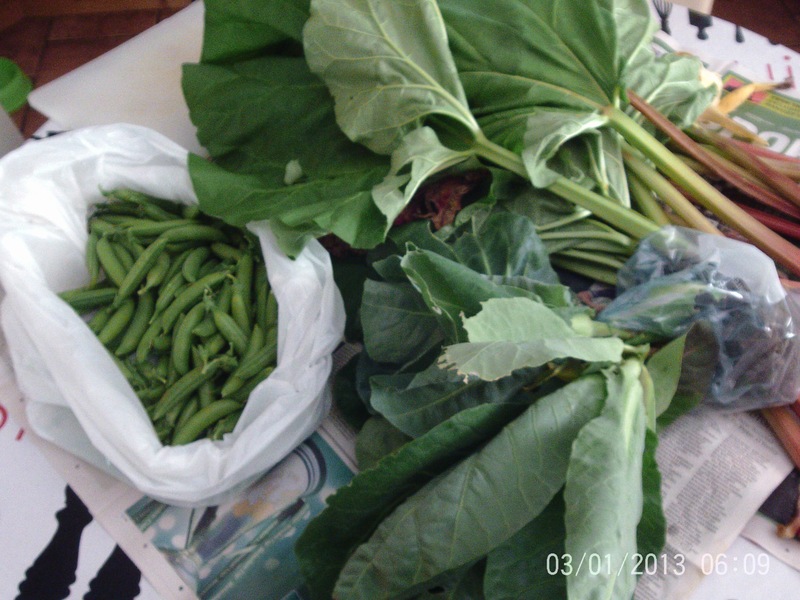 We collected our vegetables grown in the school garden. 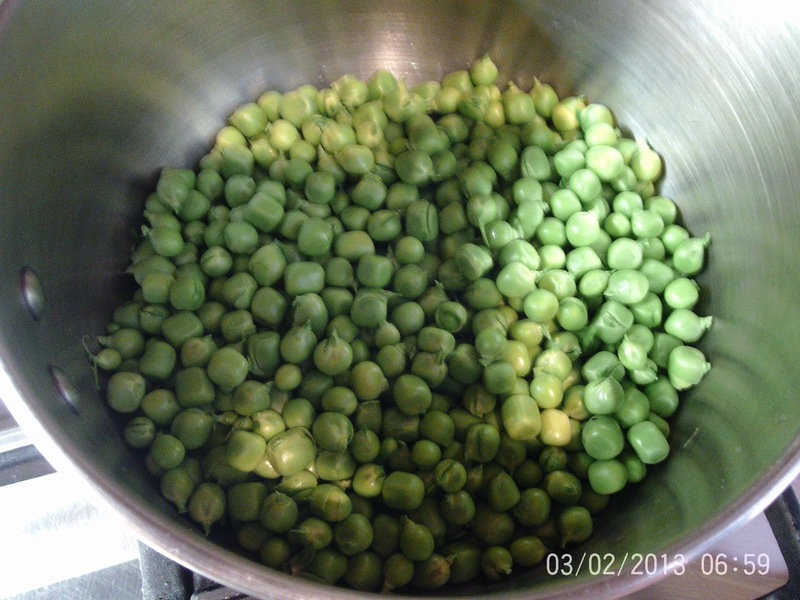 Potatoes, cabbages and peas were particularly successful this year. 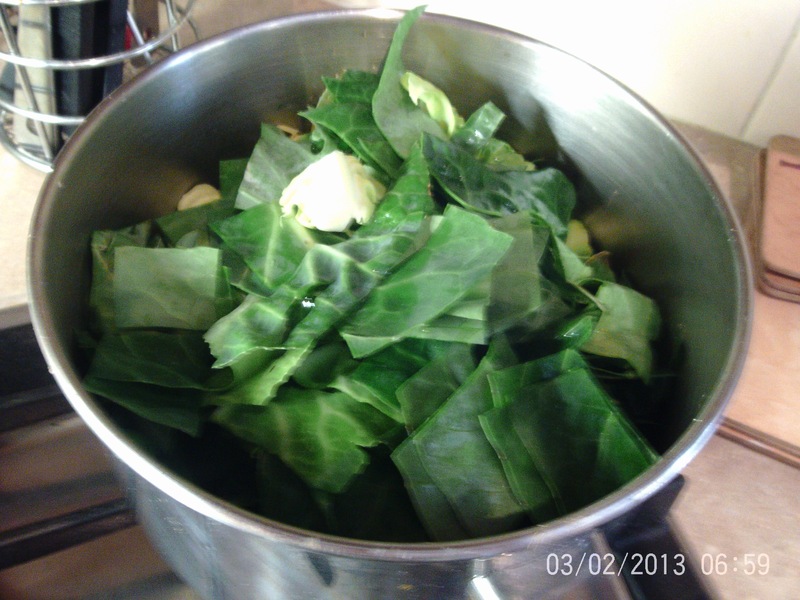 The Rhubarb was collected to make chutneys for the fete. The strawberries were delicious. 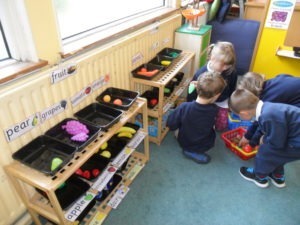 We will continue to work in our garden and try new ideas. The days and weeks are passing quickly. Each year comes with more and more ideas to include in the timetables which are already jam packed. Overall the staff do a terrific job in finding a balance with them all. The staff and I would like to welcome you all back after the Summer holidays. Thank you all so much for the vouchers and presents you gave us all at the end of the Summer term. They were very much appreciated. I would also like to take this opportunity to welcome our new Junior Infants and their parents and the families who are new to the school in other classes. Thank you to the PTA Committee and to all those parents who baked, brought in items to sell and who helped out both during the week before and at the Fete itself. 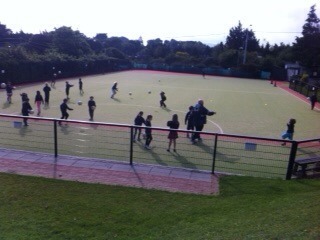 The day was a great success and raised much needed funds for the parish and school. I am pleased to welcome Mrs Aoife McMurdock to the staff. 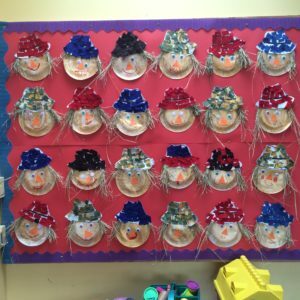 She will teach 6th Class in place of Ms. Rebecca Waugh who has taken up a permanent position in St. Patrick’s Dalkey – we wish her all the very best for the future. Ms. Rebecca Kelly will remain with us in Resource Teaching. Please read all Newsletters carefully for important information. 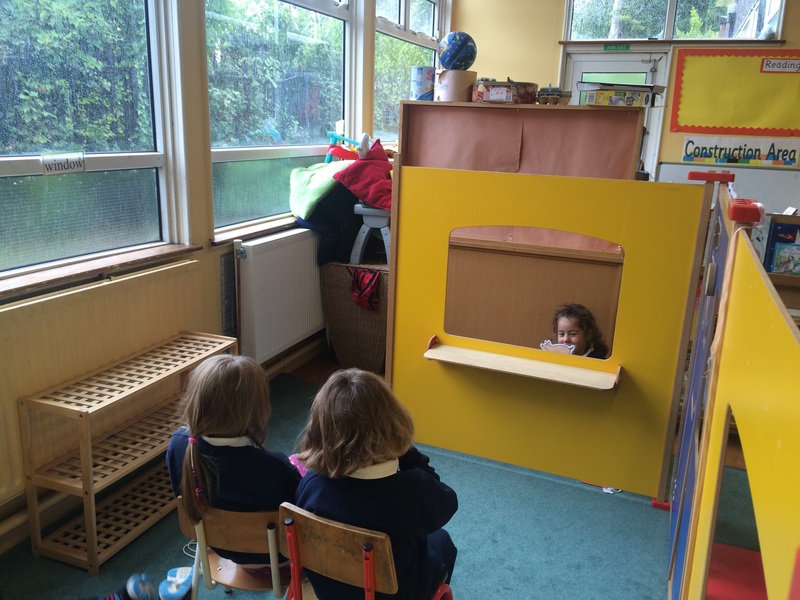 ● Games begin again next week (2nd to 6th Classes) and a separate note has gone home. 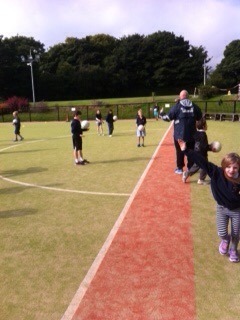 Please can you collect your children promptly after games as the games teachers have other commitments to attend to. If your child is allowed to walk home alone/leave the school grounds unaccompanied and you have not signed a consent form in the past to give your permission, please ask Trish for one. ● Whole Class Meetings will take place for parents from 2nd to 6th Classes inclusive on Thursday 17th September. 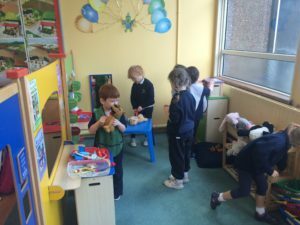 The meeting for Junior Infant parents will take place on Tuesday 15th September, for Senior Infant parents on Wednesday 16th September and for 1st Class on Thursday 24th September. A separate note will go home with details. ● Swimming will begin again on Friday 11th September for 3rd and 6th Classes. A separate note has gone home. There are still a couple of spaces on the Rota on the notice board. ● PTA events – you will be advised shortly about this year’s Sponsored Walk in Carrigollogan Woods and the date of the PTA AGM. ● Grip Youth Club will recommence on Saturday 12th September. Secondary pupils are invited to attend on 12th from 7.00 p.m. to 9.00 p.m. in the Erck (Church Hall). 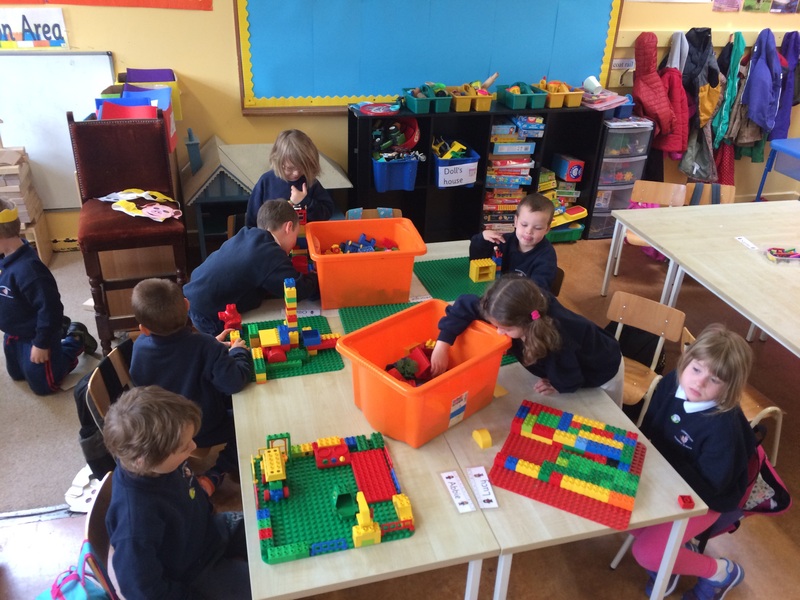 On Saturday 19th September, it will be the turn of 5th and 6th Classes, again from 7.00 p.m. to 9.00 p.m. in the Erck (Church Hall). Friends are also welcome. These groups will continue to meet every alternate Saturday, both under the leadership of our new Youth Leader, Jonathan Byford who has taken over from Sam Stott. We wish Sam all the very best in Canada. ● Week commencing 5th October has been designated as Skipping Week for Down Syndrome Ireland. More details will follow nearer the date. ● Friday 23rd October – Dress Up Day for Goal, to raise money for refugees – each child should bring in €2 on the day – a separate note will follow nearer the date. ● A Vacations/Holidays note has already gone home and a copy will be put up on the website. Please note that the school will be closed for the mid-term break from Monday 26th October to Friday 30th October inclusive. I hope that this will facilitate early holidays. Please note that these are on the website. A limited number of grants are available to the school to cover electricity, gas, some maintenance and ancillary staff. However in order for us to maintain the building and grounds to a good standard we have to supplement this. It is through your Voluntary Contribution and fund raising events that we achieve this. Last year your money went towards maintaining the astroturf pitch which was thoroughly hoovered, anti-mossed, and sanded with additional maintenance in small areas. The top playground was resurfaced and a new fence and signs put in. Playground markings have been ordered. All the bathrooms have also been repainted. None of this could have been carried out without your additional help as no grants are provided for this type of work. I want to thank you all for your continued support in this way. A sign-in system operates for children who are late into school and therefore miss roll call. 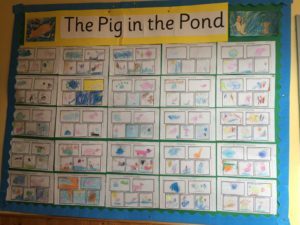 Any children coming into school after 9.00 a.m. must call into the Office, accompanied by a parent/guardian, before going to their classroom, to be signed in by Trish. Otherwise they will not be covered by the school insurance on that day. If pupils are to be late, due to certain unavoidable appointments, it is essential that parents inform the school prior to the appointment so that they can be included on our roll. As last year, I will be taking note of regular latecomers and letters will ensue if lateness persists. If your child is absent from school for any reason, the school should be telephoned early in the morning, preferably before 9.00 a.m. and Trish should be informed of the reason for his/her absence. This absence should be followed up with a note on the child’s return to school. This is essential to ensure that the school is aware of the whereabouts of all of the children in our care. 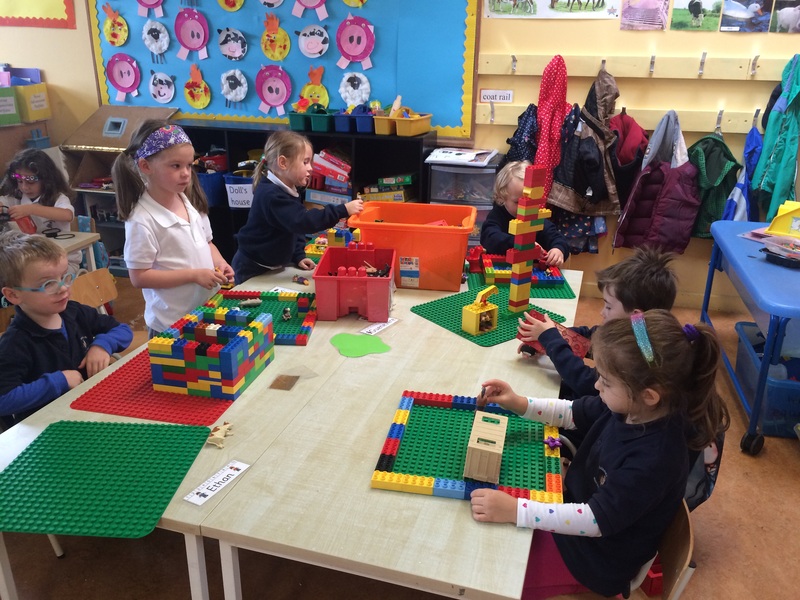 Parking in the school grounds is for Junior and Senior Infant Parents only in the morning and 1st and 2nd Class parents only at 2.25 p.m. Cars can only be parked in the spaces provided. No driving in to the school grounds during games or during outdoor activities in school hours. Gates are closed for these activities and at 2.35 p.m. for Games. You are also asked that you collect your children promptly at 1.25 p.m. (Junior and Senior Infants) and drive out immediately and also at 2.25 p.m. (1st to 6 Classes inclusive) so that Games may safely commence on time. The pedestrian crossing must be unobstructed at all times – children have priority when crossing. Please be aware of the crossing and do not stop on or near it to talk to other parents as this holds up traffic generally and obstructs the view of other drivers approaching the crossing. Please drive slowly in the grounds and do not overtake under any circumstances, particularly on the crossing. Cars should not be left at the set down area for any reason as this again disrupts the smooth flow of traffic nor should cars be parked haphazardly in the grounds – please do not block other cars in or park on double yellow lines. Generally if you cannot find a space, please keep driving round until one is free. I will be patrolling the grounds at peak times to ensure that the rules of the carpark are respected. The Gardaí have asked that you do not park on the Dublin Road (side of school grounds). Parking is available beside St. Anne’s School and in the grounds of St. Anne’s Church. However the latter is for set down and pick up only – please do not leave cars parked there. 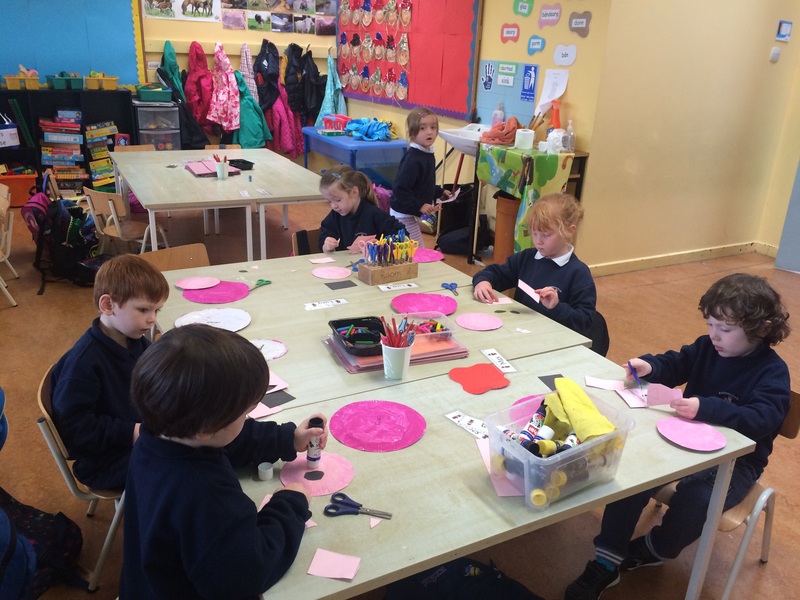 You will be encouraged by your children’s teachers (Snr Infants – 6th Class) to discontinue accompanying children into the classrooms each morning unless you have to meet the teacher. Please encourage your children to cross with the Traffic Wardens as they have been put there for everyone’s safety. Lessons learnt in crossing the road safely will stay with the children when they leave us for secondary school. Please be aware that school doors open at 8.40 a.m. every morning and children are not supervised by teachers until this time. 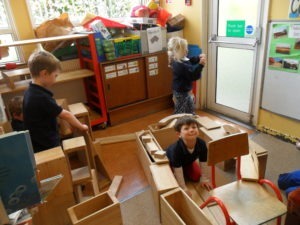 Accordingly, while of course the school grounds will be open to the pupils, the school cannot accept responsibility for children arriving before the official opening of the school or remaining in the school grounds after school. Parents must accept responsibility for each of their children who are in the school grounds before official opening time and for younger children not attending the school, while waiting to collect older siblings at going home time. The School will be open to receive pupils from ​8.40 a.m. Classes will commence at​8.40 a.m. Without good reason, no pupils should arrive later than​8.40 a.m. Lunch break is from ​12.45 p.m. to 1.15 p.m.
Parents who wish to have their children escorted home before school closing time should arrange to have them met at the classroom by arrangement with the teacher (having first called in at the School Office) at the appointed time. All pupils should vacate the premises at 2.25 p.m. unless remaining behind for legitimate extra curricular activities. Pupils who are not collected at 2.25 p.m. owing to parental delay or misunderstanding should go to the Office. Pupils from 1st to 6th Classes inclusive have been issued with Homework Journals. These should be signed by a parent on a daily basis to confirm that homework has been completed and checked by the parent. Please ensure the Contact Details section of the Journal is fully completed. School jumpers and white or navy polo shirts (all classes) and Hoodies (from 3rd class up) ARE TO BE WORN AT ALL TIMES. These may be ordered directly from the Office. Please ensure that your child wears the polo shirt or required jumper at all times. I will be conducting spot checks on uniforms throughout the term. Please also name every item, including coats, particularly those belonging to the Junior and Senior Infants. The Choir has recommenced and auditions have taken place. 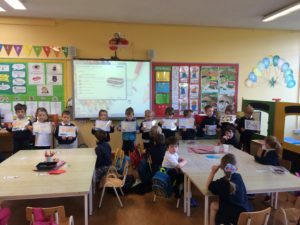 Pupils have been advised of the outcome. Choir practice begins at 8.30 a.m. sharp each Wednesday. Please ensure that if your child is a member of the choir, he/she arrives promptly for practice each Wednesday as late comers cause a huge disruption and Mrs Lewis only has a short period of time to work with the group. Pupils are expected to remain in the Choir until they finish 6th class. Should there be a reason to leave the Choir, Mrs Lewis must be informed as a matter of courtesy, both personally and by letter. A small amount of money is available for single parent families, unemployed parents etc. Please submit your request for this by the end of September. Your share of the money available will be deducted from the 1st term’s bills. Teachers are available for brief queries each morning. Please do not detain teachers at lunchtime or after school unless by appointment. As usual we are appealing for your old mobile phones which we collect for charity. Please ask friends and relations for theirs also. There is a box in the Crawford Concourse to put them in or they may be left in the Office. Children who have mobile phones should have them switched off and in their school bags during the day. If seen they will be confiscated. The taking of photos in school with mobile phones is strictly forbidden and will be dealt with severely. We are instructed by the Department of Education and Skills to advise you of the breakdown of the 36 additional Croke Park Hours in the 2015/16 academic year. These hours were allocated to staff meetings, school planning, curriculum development, policy development and school arranged in service. In line with the Department of Education and Skills guidelines, our school operates a healthy eating policy. We would appreciate if you would co-operate with this by ensuring your child brings a healthy lunch to school each day. Crisps, chocolate and fizzy drinks are not permitted. 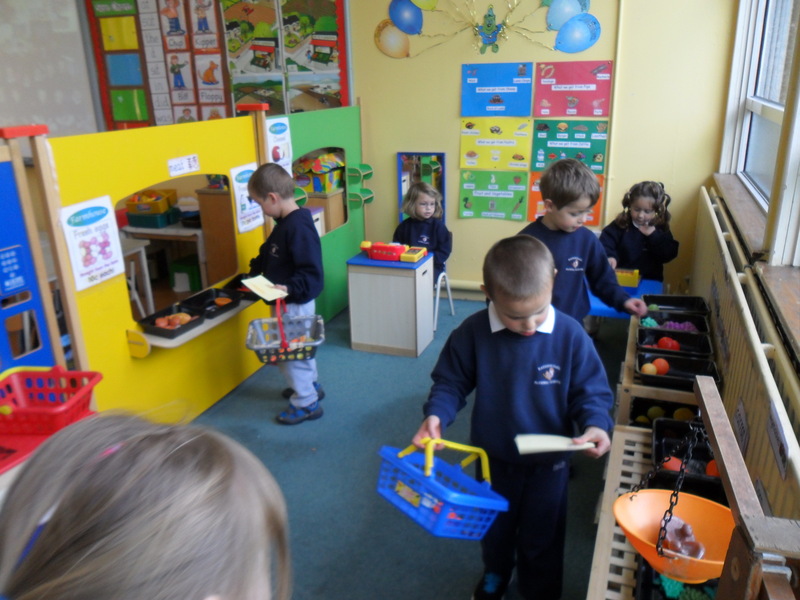 However we have treat days on Fridays, when you may include a small bar of chocolate in your child’s lunch box. Please remember that the first Wednesday of every month is 50 cent day, when each pupil is asked to bring in that amount which goes to the Fields of Life Ministry to help support a child’s education in Uganda, Rebecca. We are also continuing to support Yunuso, in 3rd Level education. 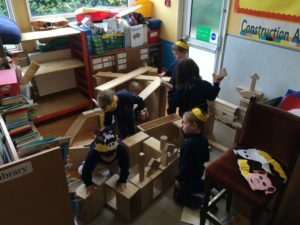 A huge THANK YOU to everyone who helped prior to and during the Fete with the PTA stalls and games – the PTA Committee really appreciate all your efforts. Thanks also to all the children who took part in the Fancy Dress competition – your outfits were all fantastic. 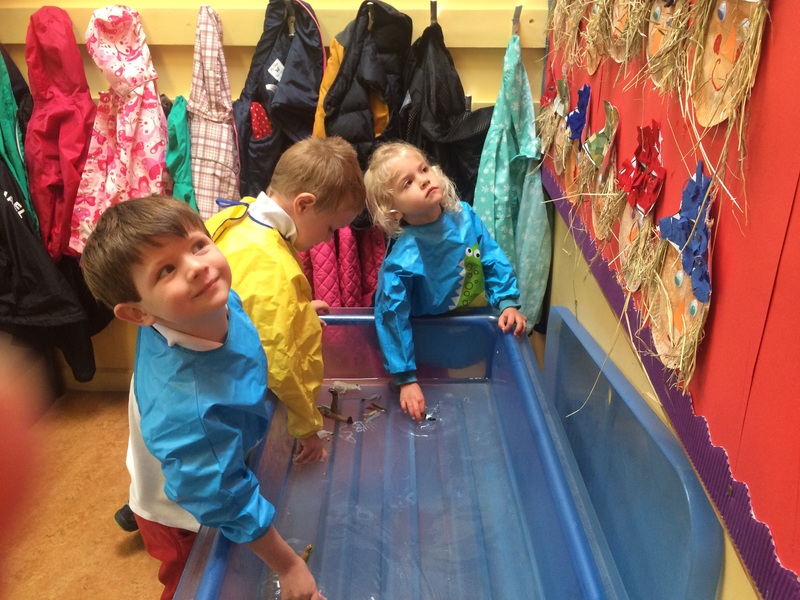 Louise, Sam, Geoffrey and Richard will be finishing their 2 year term with the PTA at the AGM and we require parents to volunteer to go on the Committee in their stead – please contact a PTA Committee member or Trish in the Office. The PTA function is to support the school by organising fundraisers and other social events and it is a great opportunity to get involved in school life. It is a 2 year term, the first year is very much a hands-on learning experience and in the second year you take on a role of either chairperson, vice, treasurer or secretary. At the AGM, besides voting for the new committee members, attendees will be given a run though of events of the past year from Caroline Senior, the PTA Committee and June Lawless on the Sports side of things.